You don’t have to be perfect to advocate; you just have to do it. 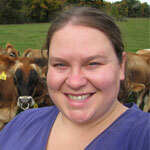 Six years ago, I agonized over the decision to start a farm Facebook page. I was already doing some advocating on my personal profile and thought, maybe that’s enough. Would I even have enough to say to have my own page? Would anyone even care about what I was saying? Could I really make a difference? Looking back now, I can’t imagine the last several years without advocacy in my life. As much as I love it now, it was pretty scary to start out, but if you love this life and want a shot at continuing it, we need you. The more farmers telling their story the more people we will reach. I’m not telling you to go buy an expensive camera and start making epic videos. I started out by simply talking about what we do every day. Feed the cows, milk the cows, keep the cows happy and healthy. It eventually grew into talking about the bigger themes of what we do: why/how we use antibiotics, how I know the milk you buy is safe, and why cows live in barns. The more I posted, the more confident I became. There were definitely some pitfalls along the way. Occasionally, my posts would confuse people, or I’d get questions I wasn’t sure how to answer eloquently. I’ve deleted my fair share of posts and even asked for advice a time or two, but no matter what, I was always honest, and I was always myself. It wasn’t until I started making videos that my page really took off. If I’m being completely honest, the first video I posted was simply a video because I felt too lazy to type the post out. It didn’t take me long to notice how much more engaged people were becoming. My videos got more likes, comments, and views than most photos I’d posted. The most recent leap in my advocacy journey came thanks to a dairy leadership program and the confidence it gave me to share my unique voice. 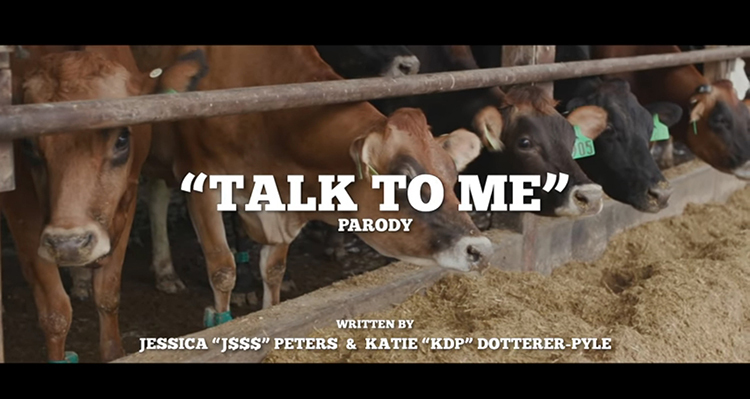 Earlier this week, my friend Katie Dotterer-Pyle and I released our first parody music video! The bottom line is that everyone shares differently. You won’t describe the way we take care of our cows the same way I do, and there’s so much value in that because maybe your way of thinking will resonate with people who don’t understand mine. Keep it real, keep it honest, and keep it fun. If you need help, ask for it!